As the son of a 33-year Navy veteran, Andy spent the first half of his life on military bases throughout the world. He is a firm believer that the military family needs to be celebrated, as they have their own duties and sacrifices that are not often enough discussed. 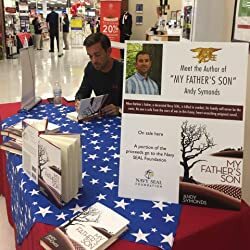 He wrote "My Father's Son" to highlight those sacrifices. Please enter your email address and click the Follow button to follow Andy Symonds! A riveting thriller giving the reader an up-close, behind-the-scenes look into the SpecOps brotherhood in the vein of American Sniper or Lone Survivor, with heart-racing action sequences that could only be relayed by a real Navy SEAL.